My book has been taking up quite a bit of my time lately but I am happy to report it is just about complete. You are no able to download a PDF off my website...you will of course need a password to do so and you will note it is officially Copyrighted so take it easy with the file sharing...and don't let me catch you trying to sell it for money unless you are an affiliate. I actually sent it in the the US Copyright Office. Now that doesn't mean I don't want you to share it. I do. And I have seen quite a bit about various artists who have gone the creative commons route and basically given their work away for free or for a donation and have forgone DRM of any kind. That's my plan. I'm not even going to attempt it. I know plenty of people will be willing to pay for it once they see it...and I know people will copy it. If you want to see more books like this some of you have better pay for it. It cost me quite a bit in time and money to get this thing done they way I wanted it done. I expect you will be pleased with the result. If you have comments I'd love to hear them. I expect people will share it. I also expect some people will get the PDF and really want to get a book or pay for a version that can go on their favorite E-reader. Like Kindle, iPad, Sony's E-Reader or Nook or what have you. It seems to me if you have an iPad or other tablet the PDF should be good enough. The plan is to have it available on Smashwords which will push it to several formats, plain ol' regular PDF, a PDF with lots of hyperlinks to vids and web pages and of course an actual Hardcover Children's book. Right now the PDF is done. I really want the hardcover book to stay around 10 bucks but that may or may not be realistic. As you can see it's full color and full color and lots of graphics adds to the cost of printing. I have a couple ideas for "pre-editions" that will hopefully pay for a run of hard cover books. So I have quite a ways to go. I will probably start off with a soft cover pamphlet type where you take a 8 1/2 x 11 and fold it in half hit it with a stapler and there you are. There is nothing like taking a book to bed, and although the concept is on it's way to being obsolete we are not there yet and I think kids will enjoy the rhymes and bright colors this book contains. 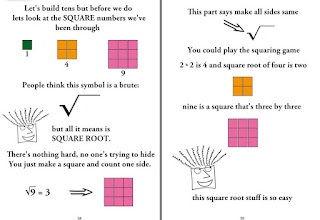 Here you see where I take a short digression into the concept of square roots, but mostly it is a book on addends and addition at the very end I introduce the concept of multiplication by two. It really is a book for 5 year olds (and under) and the idea is to have it be a bedtime story book that gets read over and over again like "Cat In The Hat" or your favorite Richard Scary book...my sons ask for the same books over and over again, why not teach them math while you are at it? 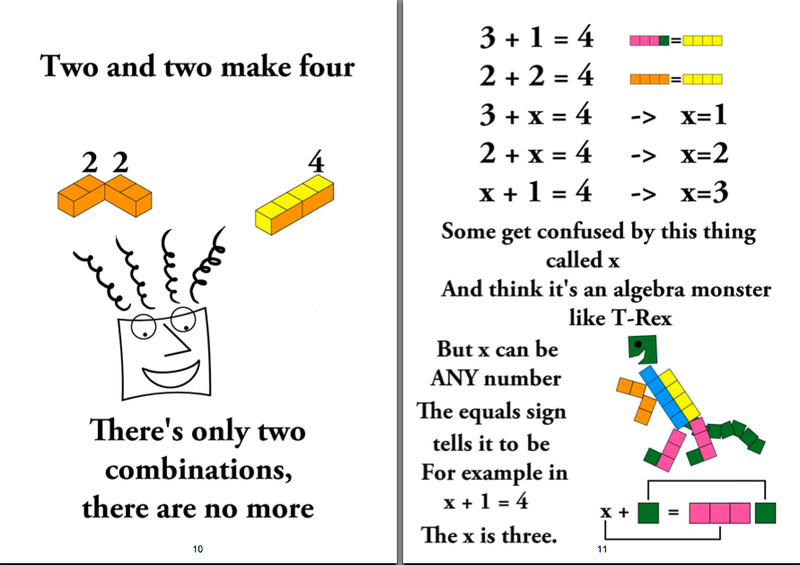 In this case you are just teaching them to count...by using addends. I also throw in some simple problem solving along the way and by the end of it we are ready for a problem where we add into the thousands. This page uses symbols but most of the pages have the blocks on them in full color as you can see. The concepts are simple and any little kid will get it especially if you read 30 or 40 times (or more) over a couple of years...I know little kids who have "The King, The Mice, And The Cheese" memorized. 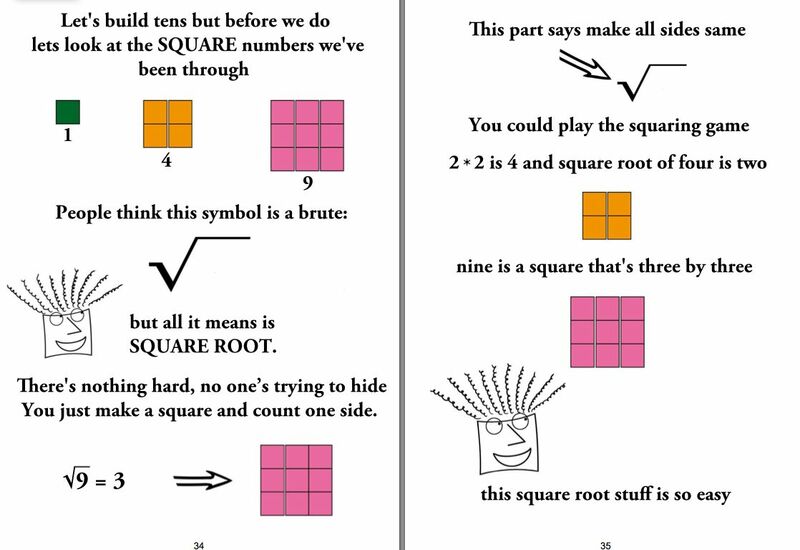 Might as well memorize some math facts too...but up until now there hasn't been a book like this where they can SEE the numbers. I will also make a screen cast where I point out what I had in mind when I made this book and how you might use it to best effect, and I will also point out a few things you might want to emphasize to your child. Also I would like to point out that older students will also enjoy this book because with our public school system the way it is the concepts in this book may be considered appropriate for students who are older. Perhaps much older. I know I was supposed to work more on my website, especially the fractions page but this book kind of took on a life of it's own so I went with it. I am pleased with the result and think it will be worth the five or ten bucks it takes to get yourself a copy in whatever form you like best. The Password Protected PDF's Page costs 5 bucks to get into. Once you have a Password you not only get this book for down load but a bunch of other PDF's and videos you won't find anywhere else. Hopefully this is just h beginning of the books. 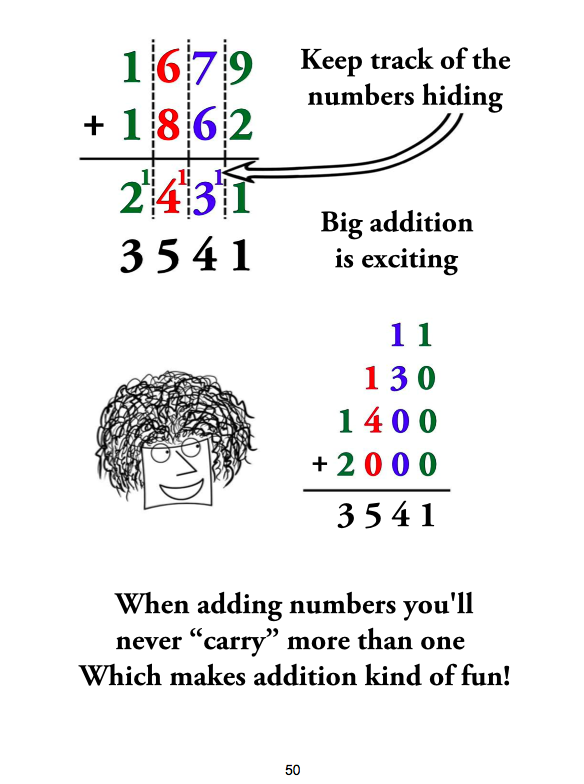 Supremely Simple Subtraction is partially finished and so is a coloring book and a few other things. 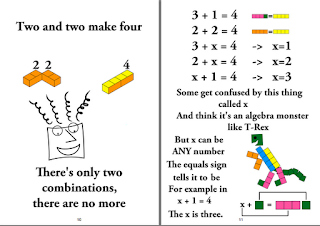 Plus I have an endless amount of ideas for the many and varied topics that make up the mathematics, in such a fashion that they make sense and people can see how it all ties together to make up the beautiful language in which the universe is written. 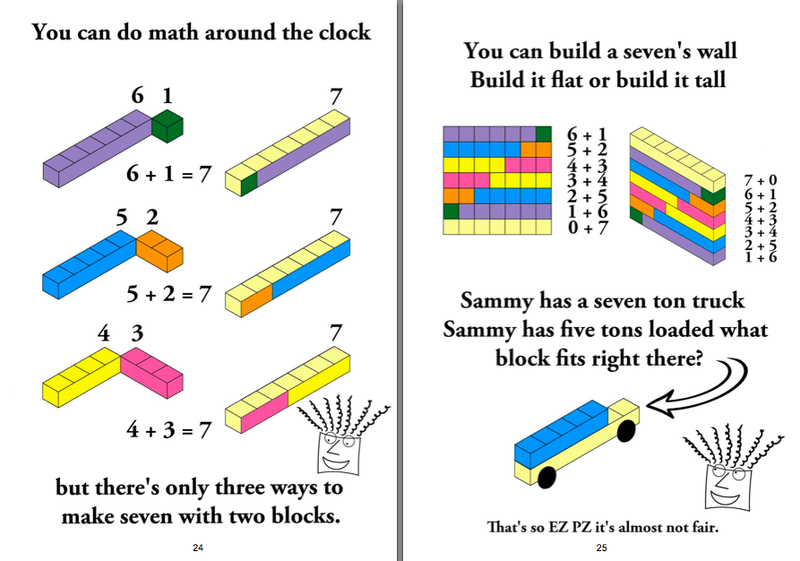 TERC = Lame and ineffectual way to teach math. Crewton Ramone Playing With Polar Coordinates.